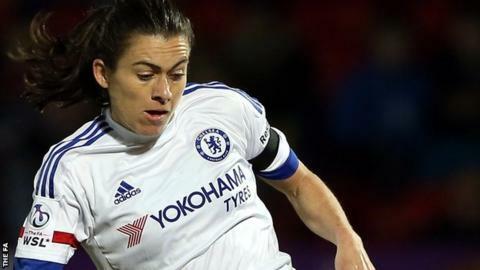 England trio Karen Carney, Katie Chapman and Eni Aluko all struck as Chelsea Ladies started their Women's Super League title defence with a 4-1 win over Doncaster Rovers Belles. The Blues, who won the FA Cup tie against Rovers by the same score last Sunday, were in rampant attacking form. Carney scored from the penalty spot and, despite Claire Rafferty's own goal, headers by Beth England and Chapman earned a 3-1 lead. Aluko's fine strike sealed victory. Carney's opener, after Millie Bright was fouled by Rhiannon Roberts, came at the end of a typical Chelsea break in a first half full of good movement, intricate passing and goal-scoring threat. Rafferty's own goal from Courtney Sweetman-Kirk's teasing cross did little to interrupt the flow. But despite two goals from corners making it 3-1, Doncaster responded impressively in a feisty second period. Sam Tierney almost pulled a goal back after a fine move, but Aluko's calm finish settled the match. "Karen Carney was at the heart and the core of everything, especially in the first half, and she looks like she's been playing at Chelsea for years. "I thought she was instrumental in everything we did, whether she was on the left side, down the middle, or on the right. "We're a group that's got a lot of confidence going forward. Being reigning champions helps with that belief in the way that we play. I was concerned defensively for the team but that's something for us to work on." "I think as a side we're obviously disappointed. You never want to lose any matches and I know they're the champions but we still fancied ourselves, so it's disappointing in that respect. "But we won't let it knock us. We've got a month now until the next game so we're go back to the drawing board and see where we're at. They're champions for a reason and as Glen Harris likes to say, Chelsea are two years in the making and we're two months. "The Belles have always been renowned for and the gaffer made sure that the players he brought in were very aware of that and he's bringing in not just good players but good people." Match ends, Doncaster Rovers Belles 1, Chelsea Ladies 4. Second Half ends, Doncaster Rovers Belles 1, Chelsea Ladies 4. Attempt saved. Ji So-Yun (Chelsea Ladies) left footed shot from the centre of the box is saved in the bottom right corner. Assisted by Claire Rafferty. Delay in match Francesca Kirby (Chelsea Ladies) because of an injury. Substitution, Doncaster Rovers Belles. Yasmin Mosby replaces Becky Easton. Goal! Doncaster Rovers Belles 1, Chelsea Ladies 4. Eniola Aluko (Chelsea Ladies) right footed shot from the centre of the box to the bottom left corner. Assisted by Gemma Davison. Francesca Kirby (Chelsea Ladies) wins a free kick in the attacking half. Foul by Becky Easton (Doncaster Rovers Belles). Foul by Jade Bailey (Chelsea Ladies). Natasha Dowie (Doncaster Rovers Belles) wins a free kick in the defensive half. Substitution, Chelsea Ladies. Jade Bailey replaces Bethany England. Substitution, Doncaster Rovers Belles. Rachel Newborough replaces Samantha Tierney. Foul by Gemma Davison (Chelsea Ladies). Emily Simpkins (Doncaster Rovers Belles) wins a free kick in the attacking half. Becky Easton (Doncaster Rovers Belles) wins a free kick on the right wing. Attempt saved. Ji So-Yun (Chelsea Ladies) right footed shot from the centre of the box is saved in the bottom left corner. Assisted by Gemma Davison. Corner, Chelsea Ladies. Conceded by Leandra Little. Attempt blocked. Gemma Davison (Chelsea Ladies) right footed shot from outside the box is blocked. Assisted by Hannah Blundell. Niamh Fahey (Chelsea Ladies) is shown the yellow card for a bad foul. Foul by Niamh Fahey (Chelsea Ladies). Kasia Lipka (Doncaster Rovers Belles) wins a free kick in the defensive half. Substitution, Chelsea Ladies. Francesca Kirby replaces Gilly Flaherty. Substitution, Chelsea Ladies. Gemma Davison replaces Karen Carney. Millie Bright (Chelsea Ladies) wins a free kick in the attacking half. Attempt missed. Ji So-Yun (Chelsea Ladies) right footed shot from a difficult angle on the left misses to the left. Assisted by Karen Carney with a cross following a corner. Corner, Chelsea Ladies. Conceded by Rhiannon Roberts. Corner, Doncaster Rovers Belles. Conceded by Gilly Flaherty. Foul by Katie Chapman (Chelsea Ladies). Natasha Dowie (Doncaster Rovers Belles) wins a free kick in the attacking half. Attempt missed. Bethany England (Chelsea Ladies) header from the left side of the box misses to the right. Assisted by Karen Carney with a cross. Millie Bright (Chelsea Ladies) wins a free kick in the defensive half. Foul by Jessica Sigsworth (Doncaster Rovers Belles). Foul by Karen Carney (Chelsea Ladies). Courtney Sweetman-Kirk (Doncaster Rovers Belles) wins a free kick in the defensive half. Foul by Gilly Flaherty (Chelsea Ladies). Natasha Dowie (Doncaster Rovers Belles) wins a free kick on the right wing. Attempt blocked. Eniola Aluko (Chelsea Ladies) right footed shot from outside the box is blocked. Assisted by Bethany England.